Be ready for the unexpected. That’s a lesson I’ve learned here. Not that I’ve never had something unexpected happen in my life, but in this life in Indonesia, I’m often called upon to do something I didn’t previously plan on. And here, it can mean living and doing something without much detail or knowing what’s coming next. Flexibility is a must-have attitude. I suppose since I was never one to need all the details ahead of time, it’s easier for me to adjust and go with the flow around here. So last weekend I had one of those moments of needing to be flexible. As usual on a Saturday morning, I was relaxed, sipping my tea after my breakfast meal of rice and fried egg. I learned from the director of my school, that I had been invited to an event in Samosir (an island in the middle of Lake Toba), hosted by the District President of the Samosir district of the Huria Kristen Batak Protestan (HKBP). The director of the school wasn’t able to attend, but I was still welcome to go. Although I had woke up that morning thinking I’d wash my clothes and get a haircut, this is the kind of thing that one is better to say yes to. Two of my students accompanied me, excited to join me along for the journey. As we made our way by public bus and ferry, we chatted in a mix of English and Indonesian. We arrived just after the cultural event of boat races had finished, but right on time for lunch. Excellent. I was greeted by the district president and also the Ephorus (whom they call the leader of the entire 4 million member denomination). After a warm greeting we sat down for lunch, which was surprisingly relaxed for being in the presence of such Important People. After lunch was a special tree-planting of the church leaders (the exact purpose of this being lost in translation). 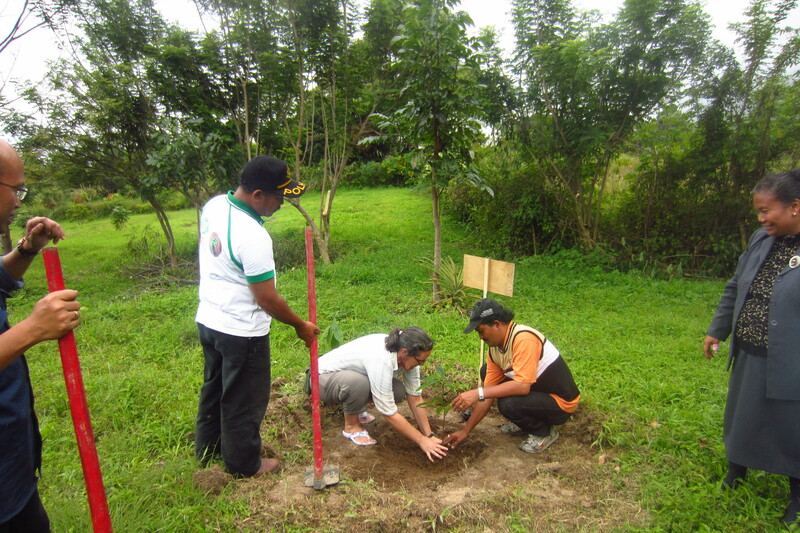 Another surprise of the day: they asked me to plant a tree, too. A nice little avocado tree. In a plot that had been reserved for some other church leader, I knelt down and planted my avocado tree just before the rain started. What might have been a relaxing, and perhaps boring day, turned out to be full of the unexpected—traveling across the beautiful landscape along Lake Toba (rather than spending a few hours hand-washing clothes), meeting with church leaders, planting a tree on behalf of the church, having fun with my students. The day didn’t go as planned, but there was blessing in it. Sometimes when encountering the unexpected, it isn’t so lovely an experience. But it is important to face that, too. Open your heart and mind and live in the moment, and surprising things just may happen. 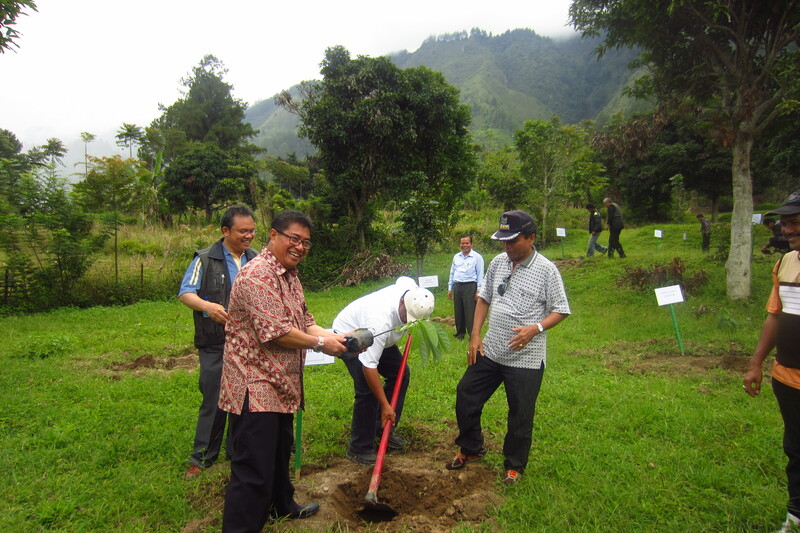 The Ephorus of the Huria Kristen Batak Protestan (HKBP) planting a tree.